The Client intends to develop a web based social networking system. In which user can create their own team and inter communication between teams are there, user can also communicate through video conferencing. 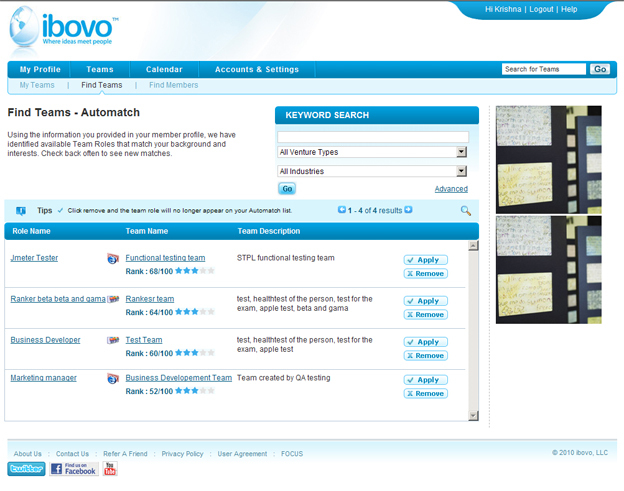 This website provides an open, friendly, atmosphere where people can create own teams, meeting, chat and appointment. If user want to share these items to his/her friend or any other then he can easily shared to them. Application provides various features to build up strong network and increase the business in different city through team building. Web conferencing is strong feature of the application; subscribed users are able to use the web conferencing and chatting through application. A) Login Page: This the mail page of the application before login, once user comes into this page he/she can logged if registered else first complete the registration and then sign in. B) My Profile: When registering as a member for the Web site, each user will create a password and complete a basic member profile. The registration process concludes with a verification of the user’s e-mail address. 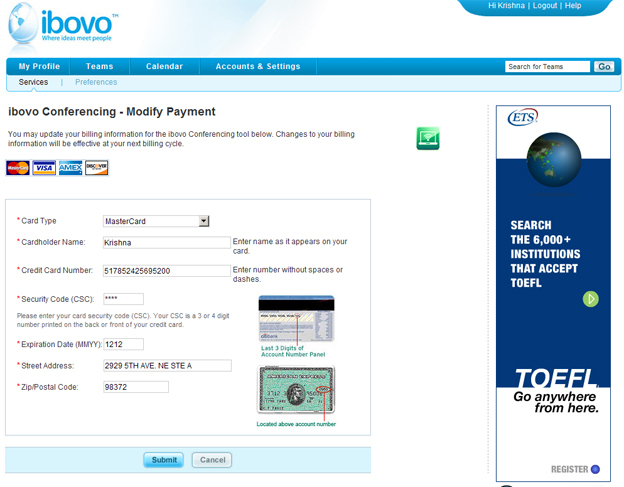 Once the registration process has been completed, the user has full access to all Web site features. 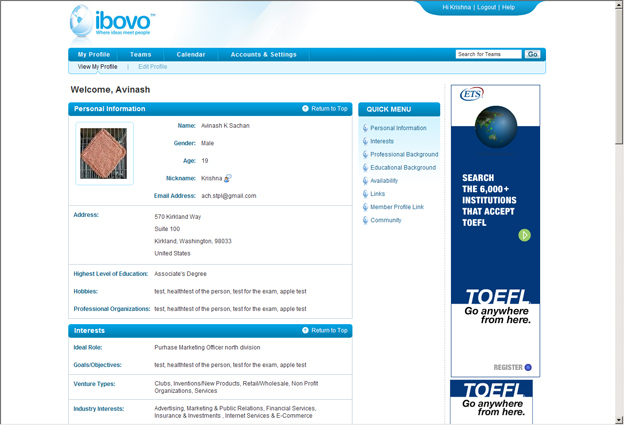 Furthermore, the user may modify their basic profile and provide more in-depth profile information. C) Teams: Members are able to create new teams around specific start-up ventures. Each team will have a profile that includes a description of the venture, industry, investment estimate, team member location Preference, privacy setting and meeting timeframe preferences. Furthermore, roles will be associated with each Team. Role profiles will include a description of the role, preferred Industry Experience, investor indicator and location preference. The member who creates a Team and associated Team Roles is known as the “Team Lead.” The system provides features for the Team Lead to recruit members for specific roles, as well as features for members to apply for a role. The Team Lead is provided with a dashboard view and basic workflow showing all members that have been recruited or have applied for roles, members that have been accepted for further consideration and finally a capability to make a position offer to a member. 1C. Find Teams: In this section user find the teams which are matching to their profile. Using the information you provided in your member profile, we have identified available Team Roles that match your background and interests. Check back often to see new matches. 2 C. Find Members - Select a Team and Open Team Role to view a list of matching candidates. D) Calendar - The calendar lists all appointments that you have received from other members or you have created. Please review all pending appointments and choose "accept" or "decline." Click the meeting topic to view meeting details in the lower panel. 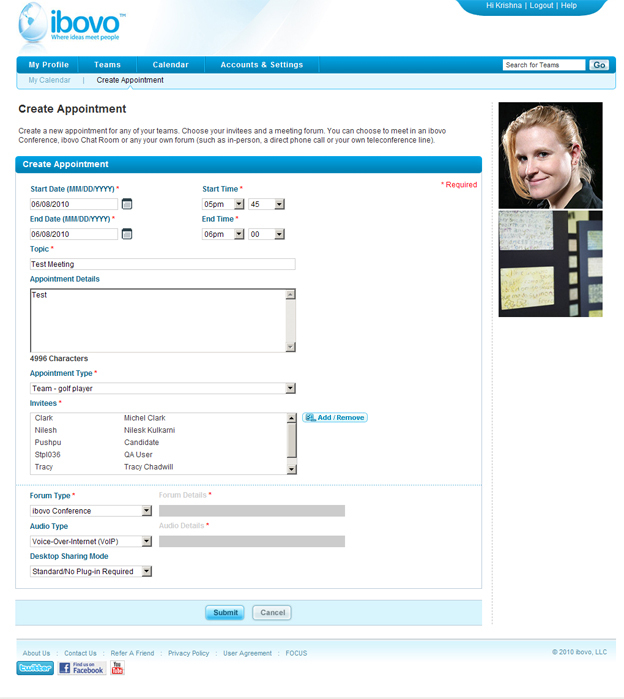 1 D. Create Appointment - Create a new appointment for any of your teams. 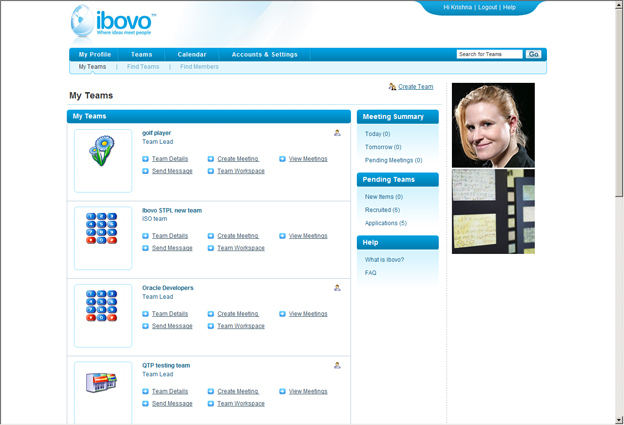 Choose your invitees and a meeting forum. 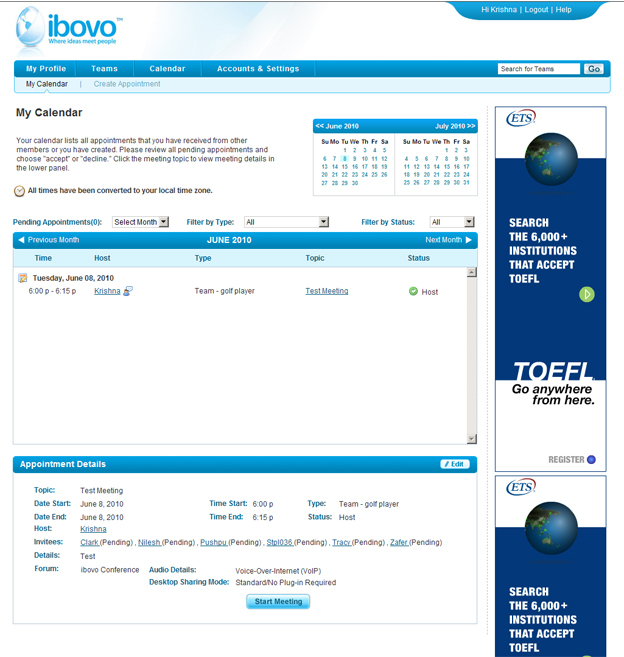 You can choose to meet in an ibovo Conference, ibovo Chat Room or any your own forum (such as in-person, a direct phone call or your own teleconference line. 2D. 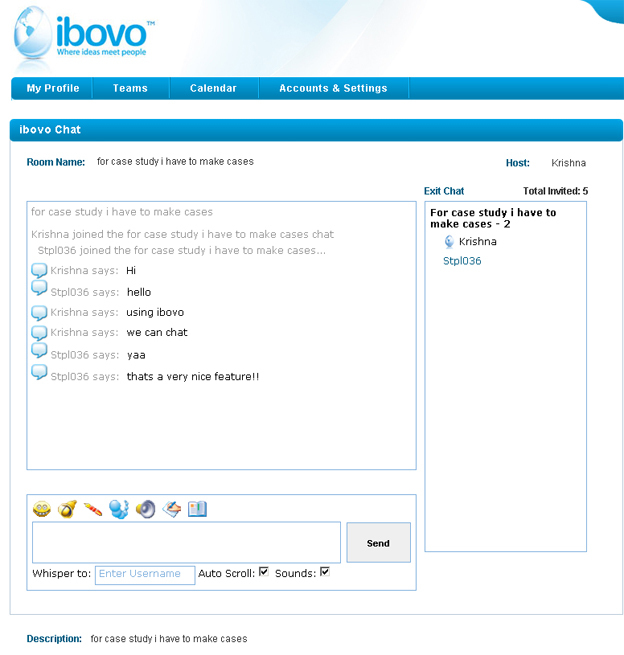 ibovo Chat - It will facilitate team meetings using text-based chat room functionality. Chat sessions are scheduled through the Calendar Appointment feature. 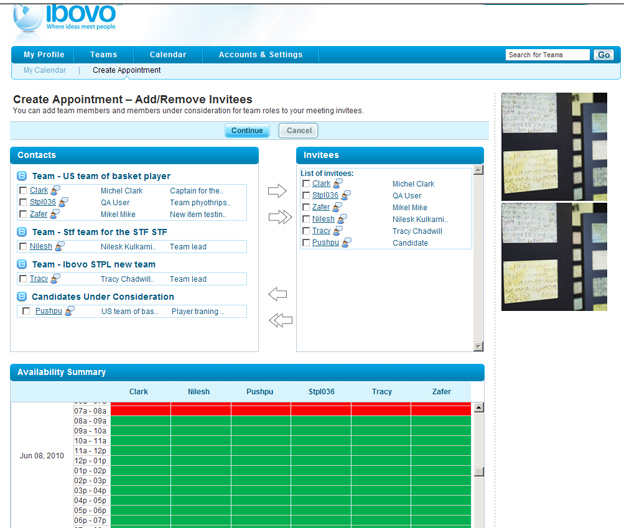 When a user creates an appointment, the “ibovo Chat” forum can be selected. This will allow all meeting invitees and host to meet within a common chat room (no other members will be able to access the chat session). Access to the chat room is provided by clicking “Start Meeting” from the meeting invites. (4) Minimize overhead expenses relating to the 3rd-party Web Conference product. 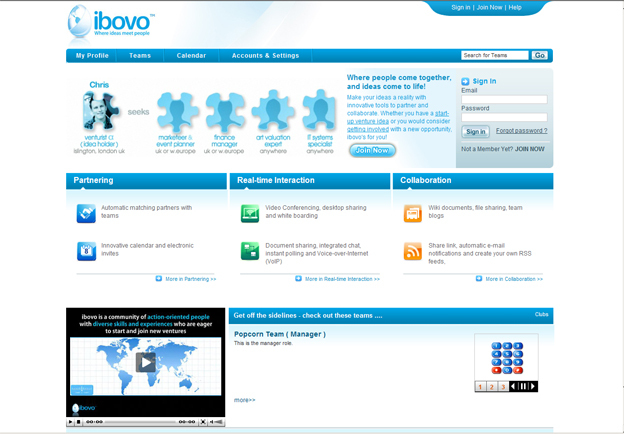 These objectives can best be achieved by integrating the ibovo system with the 3rdparty Web Conference provider to maintain a dynamic pool of generic Web Conference accounts to support the conferencing needs of the ibovo community; instead of assigning Web Conference accounts to individual members or individual teams. 1E. 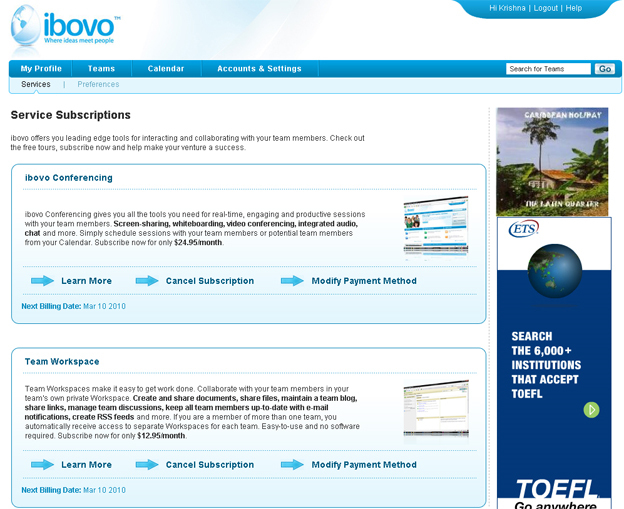 Service Subscriptions - Ibovo offers you leading edge tools for interacting and collaborating with your team members. Check out the free tours, subscribe now and help make your venture a success. 2E. 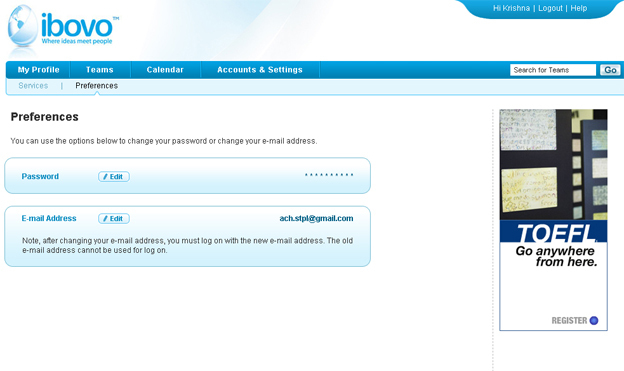 Preferences - You can use the options below to change your password or change your e-mail address. The major challenge that we faced while developing this site was integration web conference third party API and payment gateway. 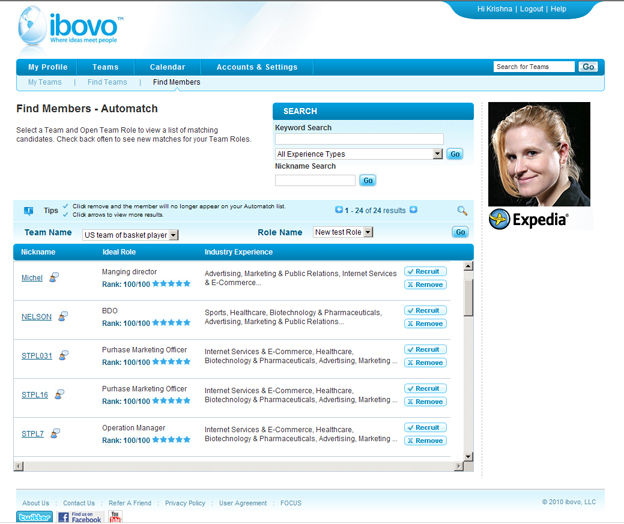 Team Profiles privacy settings and Automatch results of roles and team with relevancy. The designing of the site was also a challenge as the client was very particular about Alignment of controls &other design issues etc, Database of the site gets quite heavy with time. Time Zone conversion management is also a major achievement during the development of the application. 1.Managing different user profiles: By maintaining the user information in database and other file storing in folders. 2.Applying different screens to different user’s profile: By using different Skin files. 3.Displaying error messages through message management in the web: By using the php inbuilt functionality in message management to display the error messages.